Apple is to pork what stuffing is to chicken, or horseradish to beef. A timeless combination that almost never fails, the natural sweetness afforded by grated apple complements and helps bring out the flavour of pork. 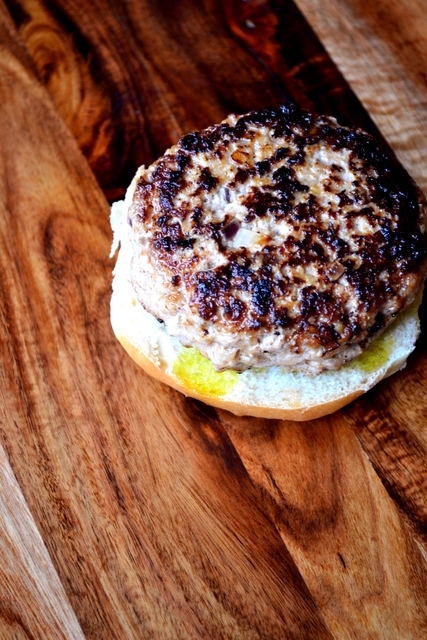 This recipe for Pork and Apple Burgers demonstrates how simple and effective the duo can be – you’ll never look back. 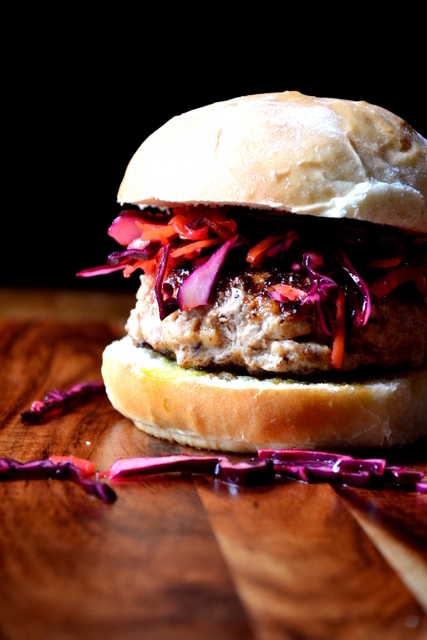 Pork burgers are quite different from those made with beef. Beef, for want of a better description, has a very “meaty” feel to it; it feels dense and filling. Pork mince, as you might expect, has a lighter make-up and makes for a very appealing contrast when you’re in need of something that little bit more dainty. Throw in a little apple and paprika and what you’ve got is a delicate burger worthy of those homemade bread rolls that have just emerged from your oven. As you’ll likely realise, I’m a fan of simplicity in cooking. One or two flavours here and there to make special ingredients sing. However, if you’re looking to spice your pork and apple burgers up a little, the addition of a few finely chopped leaves of sage would go an awfully long way. Thyme would also be a fine option, but don’t overdo it – 1 tablespoon will do; hiding the sweet apple flavour would be sinful. Tip the pork mince, garlic, apple, red onion, paprika, egg, bread crumbs, salt and pepper into a large mixing bowl and bring together thoroughly with your hands. Form the mixture into 4 patties or burgers and chill in the fridge for 30 minutes. If you’re not confident about seasoning you can cook a little of the mixture and taste. When chilled heat 3-4 tbsp of sunflower oil in a heavy-based frying pan and cook the pork burgers over a medium heat for 5-6 minutes on each side. The burgers should be golden brown and cooked through. 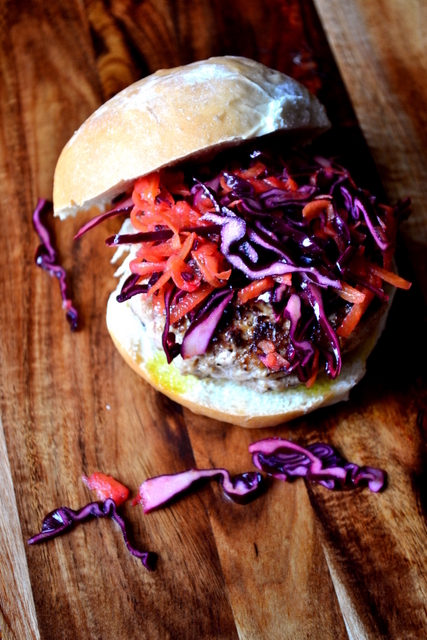 Serve in a burger bun with a handful of red cabbage slaw. Cost: At £1/100g pork mince is a delightfully inexpensive meat, even more so than beef. And if you’re watching your pennies you can pick up the remaining ingredients for as little as 80p. As such, this recipe, which yields 4 generously sized pork and apple burgers, should set you back no more than £5.80 to make. Mmm, sounds delicious! What’s that yellowish sauce you used under the patty? Or is it just the juice from the patty itself? That looks excellent Nick. Pork and apple – what a perfect combo. Thank you, Conor – the flavours worked very well. Love the recipe! Have used apple and pork together [lovely and juicy too!] but have not added sweet paprika and that touch does appeal 🙂 ! Just a little paprika really lifts the flavour in a subtle way. I’m having some this weekend, sounds delicious. I haven’t cooked one of your recipes since the Thai Red Fish Curry, which was delicious. That was a while ago 😀 – you must try something else soon! Gorgeous. Will definitely try this. Please do – so simple and effective. Thank you! They were fantastic. I can’t believe I’ve never thought to make burgers out of ground pork! I’m very keen to try this! It’s so delicious and succulent – really worth a go. Thank you – let me know what you think! Thank you – I hope it has the drool factor! 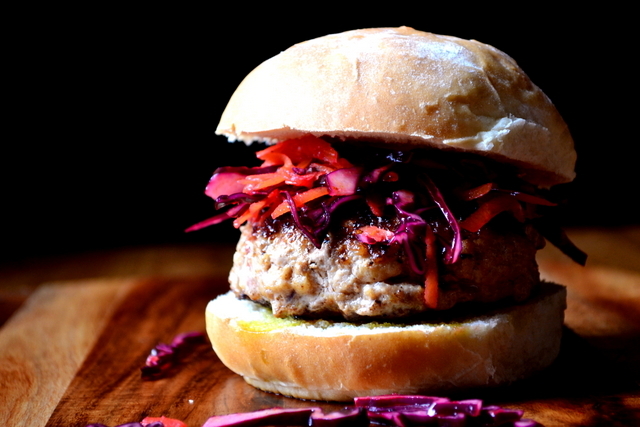 Hello, I’m looking forward to trying these pork and apple burgers. They look wonderful! I’m considering doubling the recipe and freezing half to cook another day. Do you think these would freeze well? Sorry for the late reply! They’ll freeze just fine. Enjoy. can you grill these instead of frying?